DIY garage organization isn’t an urban legend. It really is possible, no matter what you use your garage for. 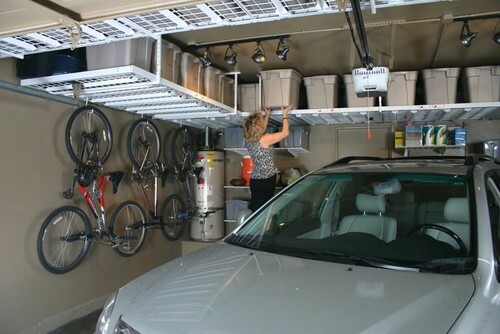 Pinterest is a great tool if you want to find ideas for organizing your garage, or almost any part of your house. It’s free, it’s convenient and it lets you keep all your organization ideas in one tidy spot. But that’s not even the best part. Pinterest lets you search for ideas using a simple keyword or phrase, like DIY garage organization. Chances are good that if you’re looking for something, others have already found it and shared photos on Pinterest (here are our boards for garages and organizing/storage). You can collect ideas to think about later on, from ways to organize, to products and DIY garage organization tips. And while you’re at it, follow Home Tips for Women! Once you've got your favorite garage ideas collected, you'll want to plan your project. Here are some important DIY garage organization measurements to help you make key decisions before you start buying products or moving things. To see them laid out visually, visit AmericanGarageBuilders.com. Savvy Homeowner Tip – As cars and SUVs seem to be get bigger with each new model, you should consider this when planning your garage layout. That will keep your options flexible in the future, and make your house attractive to the most prospective buyers. To give you an idea of car sizes compared to garage sizes, this table uses Toyota vehicles (Camry, RAV4 and Sequoia). Standard cars are 6 feet (72 inches) wide. However, you need 9 feet in a garage so you can open one (1) door fully open and a one car garage is 12 ft wide for door access and/or storage on one side of a car. Another option is the 1 1/2 car garage plan which is 16 ft wide. The standard car averages 15 ft (180 inches) in length. Garages generally start at 20 ft, going up to 30 ft for those who want a workbench or extra storage space. This extra length will also support oversize cars like the Toyota Sequoia (205 inches) or small trucks. Your standard car is almost 5 feet (58 inches) tall. But SUVs have become very popular and Toyota's models range from 67 inches (RAV4) to the their largest SUV which is 77 inches tall (Sequoia). It’s a fact of life that many, if not most, garages are not used to house a vehicle. They’re packed with storage containers, bicycles, lawn and garden equipment, and anything else that can’t be left out in the rain but doesn’t belong in the house. If you want to make space for your vehicle again, you'll have to use the vertical space to your advantage. Walls and overhead spaces are ideal storage and organization areas. You can mount bike racks on the walls, install hooks for mounting hand and garden tools. There are overhead platforms on pulleys, so you can slide on storage bins and lift them back up and out of the way again. Just make sure you'll still have enough overhead space for walking and gosh, parking your car, after installing these platforms. When you have things sitting directly on the floor of your garage, you’ve got things that are more or less stuck in that spot. Raise everything up on casters, and you’ll have the ability to rearrange, make room, and condense areas as you need to. Even oversize storage cabinets can have casters on the bottom. Work benches, too. And locking casters mean you can move them when you want, and keep them steady when you don’t. 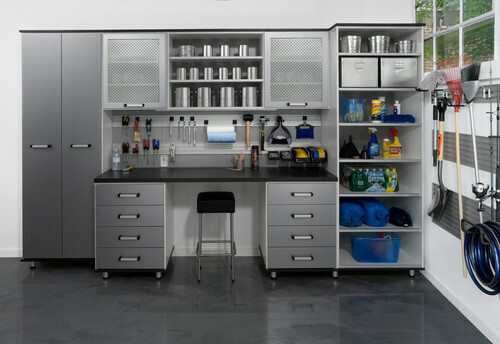 Containers, bins, drawers, cabinets — for everything you keep in your garage, there is likely a container that’s perfect. Even bicycles can fit inside some cabinets, keeping the floor clear. Garages are notorious for collecting small things such as weed trimmer string, nuts and bolts, nails, extension cords, garden twine, seed packets, and so on. But if you have a dedicated storage container for each type of item, you’ll serve two purposes at once. First, you’ll know exactly where to find what you’re looking for when you need it. And second, you won’t have to fish through a stack of other items to locate what you need, even if you do know for a fact that it’s under the pile of garden gloves, shrub shears and tomato plant stakes. 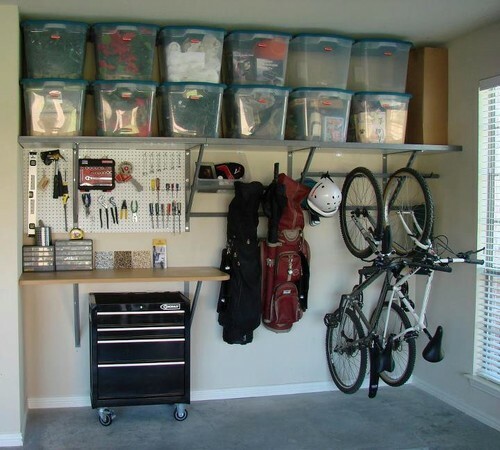 Are you planning to do some DIY garage organization this year? We’d love to hear about tricks and tools that you’re using!